Insects are vanishing. They are going extinct 8x faster than mammals, birds and reptiles. Scientists project that in 50 years half of the insects on the planet could be gone, and they could almost entirely be gone in 100 years. According to a new study published in the Journal Biological Conservation (“Worldwide decline of the entomofauna: A review of its drivers”), the total mass of all insects on the planet is decreasing by 2.5% per year. 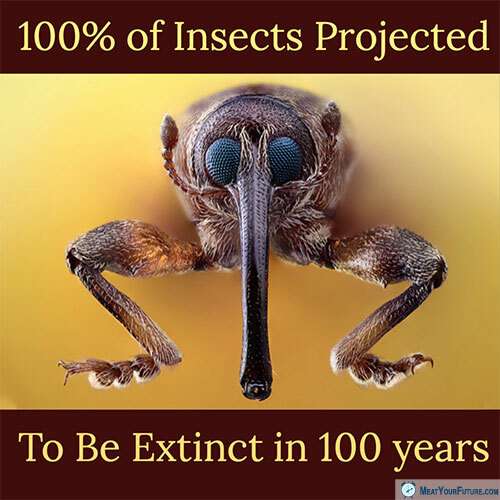 That means, if the trend continues, the Earth may not have any insects at all by 2119. While it may sound unimportant, nothing could be further from the truth. Insects our essential for our ecosystems and, therefore, for our own survival. They are pollinators and crucial in the production of foods that we need for health and nutrition (many vegetables, fruits, nuts). Insects are also a food source themselves for birds, fish, reptiles and other mammal species. So, why are they going extinct? Mostly due to land-use changes, especially agricultural intensification and use of pesticides – i.e., turning wild lands into farmland. And what happens if the insects go extinct? Quite possibly, we would follow. Does that get your attention? Hopefully, we make the urgently needed changes NOW, and not wait until it’s too late. One of the most impactful things you can do to help the situation right now is to go vegan. A vegan diet uses significantly less land and other resources than an omnivorous diet. Another way to significantly reduce your impact on the planet is to have smaller families, support family planning and women’s rights, and (if you do want to have children or more children) consider adoption as well. Every single person we add to the planet has an environmental footprint, and we need to be very mindful of the impact that 7.6 billion humans and growing has on every aspect of the environment – both in respect of how we consume and our sheer numbers.